Should I Combine Facelift, Neck Lift, and Eyelid Lift Surgery? Some people develop signs of aging primarily in one area, such as under the eyes or along the brow. 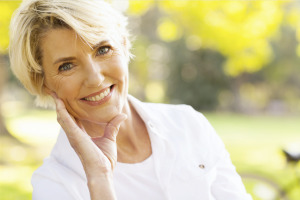 For many patients, however, the natural process of aging tends to affect multiple areas to a similar degree. For these individuals, combination treatment may provide more noticeable and satisfying rejuvenation. Furthermore, by addressing several interrelated areas, the outcome often can be more natural-looking as well as more recognizably youthful. Dr. Eugenie Brunner, our extensively trained facial plastic surgeon, applies this philosophy to beautiful effect. The eyelids, mid and lower face, and neckline have delicate skin that can more readily show the progress of time than some other areas. These regions also are interrelated. Under-eye bags can become more pronounced if skin laxity on the face helps pull down the fragile skin. Similarly, loose skin on the face can lead to jowls and a less firm and contoured neckline. By utilizing techniques for eyelid surgery, facelift surgery, and neck lift surgery, these correlated areas can each receive the rejuvenation they need. And by improving each individual area, the other regions are no longer affected by the surrounding feature to a negative degree. Dr. Brunner always thinks of the face as a series of features that all work together, and she approaches each treatment plan with the goal of providing comprehensive enhancement. By customizing your treatment plan and utilizing a multi-modality approach, she can help you achieve your cosmetic goals with lasting results.